Flamboyant Dallas Cowboys receiver Terrell Owens tried to kill himself by overdosing on pain medication, police said, even putting two more pills into his mouth after a friend intervened. An initial news report had said that Owens had suffered an "allergic reaction" to his medication, but CBS affiliate KTVT reported he had been seen being wheeled into Baylor Medical Center. A Dallas police report released Wednesday morning said Owens told his friend "that he was depressed." The female friend, who is not identified in the report, "noticed that (his) prescription pain medication was empty and observed (Owens) putting two pills in his mouth," the police report said. The friend attempted to pry them out with her fingers, then was told by Owens that before this incident he'd taken only five of the 40 pain pills in the bottle he'd emptied. Owens was asked by rescue workers "if he was attempting to harm himself, at which time (he) stated, 'Yes.'" 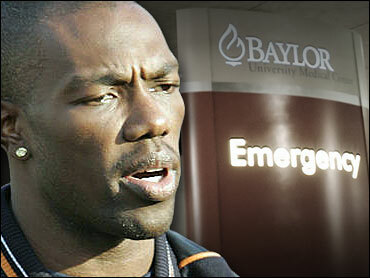 The police report says Owens was treated by Baylor staff for a drug overdose. Doctors reportedly tried to induce vomiting. Owens is recovering from a broken right hand he hurt a week ago Sunday. He had an operation the next day to have a plate screwed in, enabling the bone to heal without being further injured. Dallas Cowboys coach Bill Parcells said last week that the pain medicine made Owens ill. The Cowboys were off this past weekend and Owens was back at practice Tuesday, although he worked out on his own. Parcells said Owens' hand was improving and he was expected back on the practice field Wednesday. Owens chatted briefly with reporters in the locker room Tuesday afternoon and seemed fine. Owens, one of the league's top receivers during his 11-year NFL career, is best known for wild stunts on the field and other publicity-seeking antics off it. When the Cowboys signed him to a $25 million, three-year deal in March, they said their background checks indicated no red flags. In fact, team consultant Calvin Hill — who mostly deals with troubled players — said during training camp that his department was not involved with Owens because he didn't have a history of those kinds of problems. Dallas police officials said they were planning a news conference later Wednesday, but did not immediately announce a time. A hospital spokeswoman said early Wednesday there was no patient registered as Terrell Owens, although federal privacy laws allow people to block their name from being released.